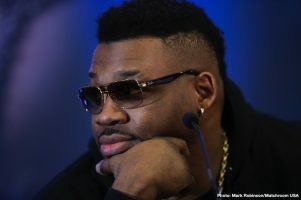 Joshua: "I'll reconstruct Miller's face"
By Tim Royner: Anthony Joshua is promising to literally “reconstruct” the face of Jarrell ‘Big Baby’ Miller when the two of them face each other on June 1 at Madison Square Garden in New York. 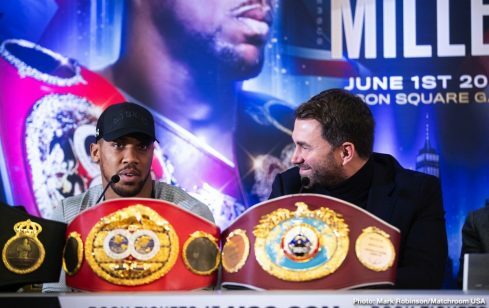 Joshua (22-0, 21 KOs) and Miller (23-0-1, 20 KOs) met up on Monday for their second news conference in London, England. 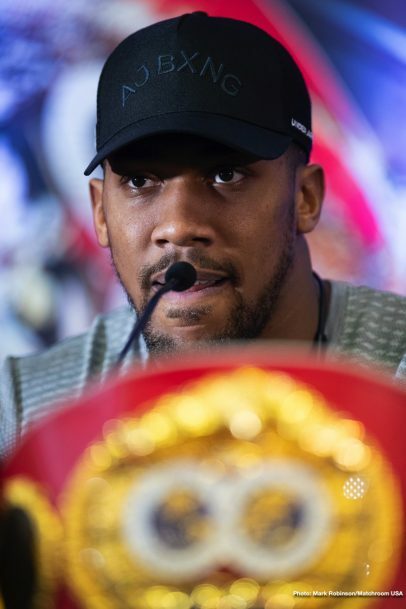 Joshua vs. Miller will be streamed on DAZN in the United States, and shown on Sky Box Office in the UK on June 1 from Madison Square Garden in New York. 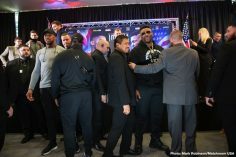 During the Joshua-Miller face off, security was standing by in case the two of them started pushing like what had happened in the previous press conference between them last week in New York. 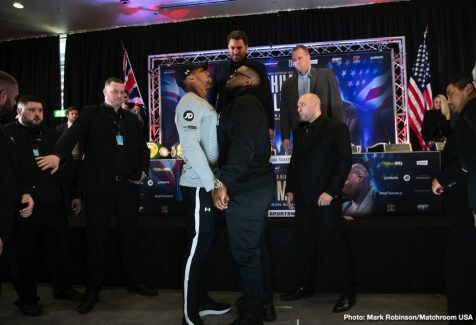 Matchroom promoter Eddie Hearn was wise to have security standing by just as a precaution for the face off, as it was tense between them. 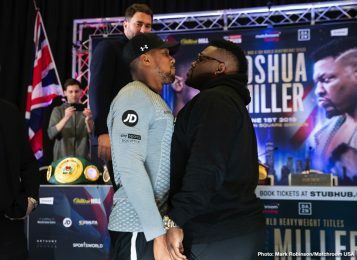 Miller looked like he wanted to slug Joshua on the spot. Miller might not be around long enough for Joshua to reconstruct his face as he says. 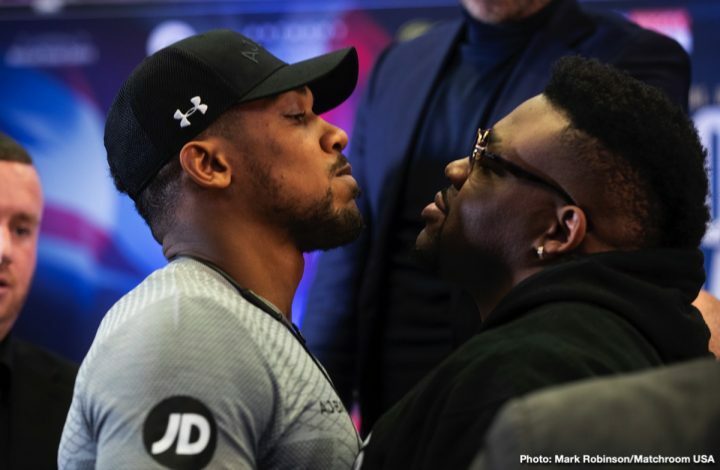 If Joshua opens up with a storm of punches early on, he could knock ‘Big Baby’ Miller quickly in this fight. 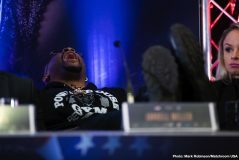 The unheralded former heavyweight world title challenger Gerald Washington had Miller hurt and close to being knocked out in the fifth round of their fight in July 2017. Washington hit Miller with eight consecutive head shots during a flurry, and he was defenseless. The referee easily could have stopped the fight, but he chose to let it continue. 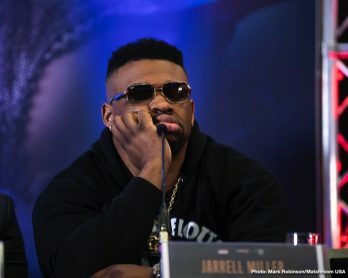 Washington punched himself out, and Miller was able to take advantage of it by stopping him three rounds later in the eighth round. 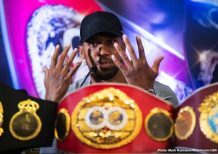 Few boxing fans believe that Miller has any chance whatsoever in winning this fight against the taller, faster and more powerful 6’5″ Joshua. Miller’s best fight will be conducted outside of the ring with him trash talking Joshua, and trying to get the better of him with his verbal skill. 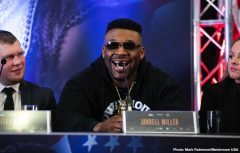 The fast-talking Miller is more than a match with Joshua outside of the ring when it comes to trash talking, but that’s not going to win him the fight on June 1. 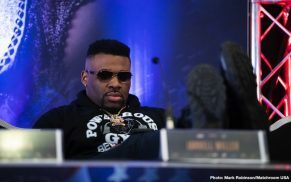 The 315 pound Miller is going to need to show what he can do inside the ring, otherwise he’s going to be left in a heap on the canvas with cameras taking closeup views of him as he lays there. 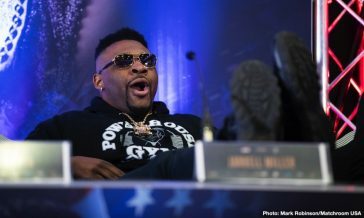 “The game-plan is to stop him in seven rounds,” Miller said. Joshua, 29, was taken aback by Miller vowing to knock him out in the seventh round. 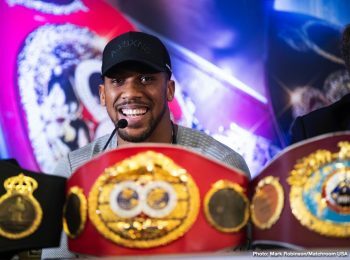 “He talks about seven rounds?” Joshua said. 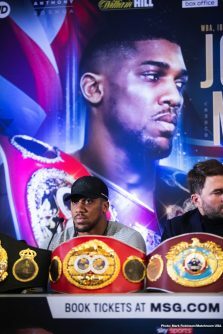 The anger that Joshua had on his face during the press conference today, it seems pretty clear that he’s not going to let Miller, 30, hang around for long when the two of them share the ring on June 1. 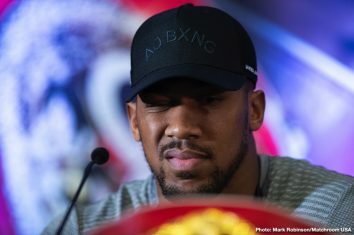 That’s good in a way because the boxing fans will see an impressive destruction job by AJ, but there will be a lot of criticism thrown his way afterwards for choosing such a poor opponent. Miller is unbeaten, to be sure, but his record is roughly a fluff one filled with weaker opponents. 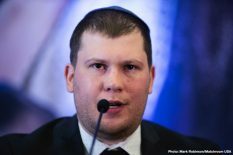 The notable fighters on Miller’s resume, Tomasz Adamek, Johann Duhaupas and Mariusz Wach, were both old and over the hill when he fought them. 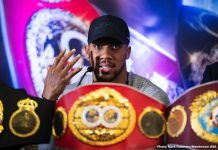 Joshua knows that he needs a knockout to impress the boxing fans for his U.S debut. 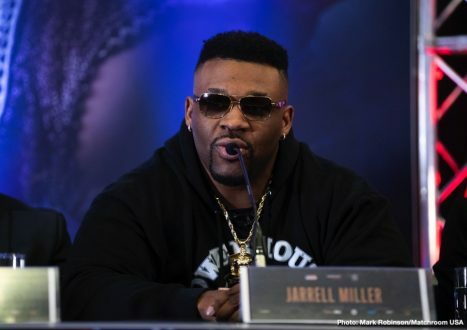 Johua can’t just beat the 315 pound Miller if he wants to make a big name for himself in front of the American boxing fans in the United States on the 1st of June. 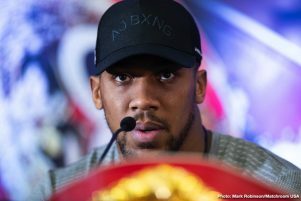 Joshua has to crush Miller and leave no doubt in the minds of the fans. “100 per cent, knock him clean out. A knockout needs to happen to announce myself in the States. 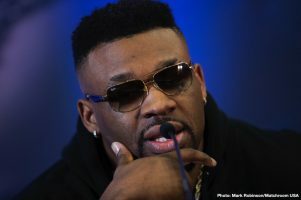 He does the talking, I do the physical stuff,” Joshua said about ‘Big Baby’ Miller. 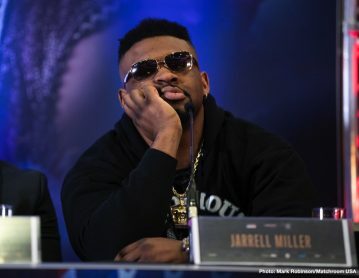 Miller looked incredibly bored while Joshua was speaking during the press conference. 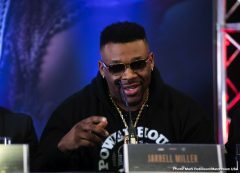 At one point, Miller feigned like he was sleeping while Joshua was talking to the boxing media. 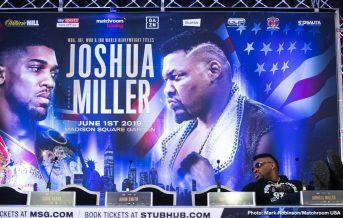 Miller was trying hard to get under the skin of Joshua, to upset him as much as possible to rile him up enough for him to get an edge. 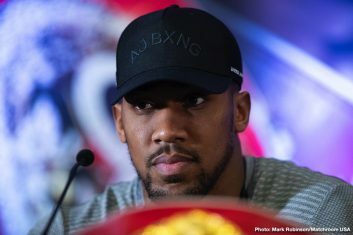 Miller wants Joshua to be furious by the time he enters the ring against him in less than four months from now, because he doesn’t fight at his best when he’s angry. 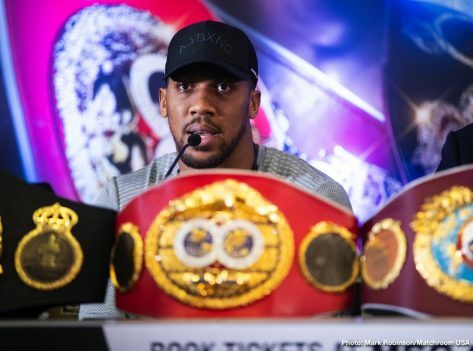 Dillian Whyte got Joshua angry in their fight in 2015, and he was able to take advantage of that by clipping him with a hard left hook in the second round that had AJ hurt. 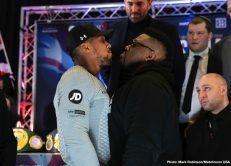 Moreover, Joshua gassed out after just two rounds against Whyte, and it took him until the seventh round for him to get his second wind to defeat him by a knockout. Joshua isn’t popular in the United States right now. This is his first fight in the U.S, and it’s going to take a lot longer than just one fight for Joshua to build up his name there. 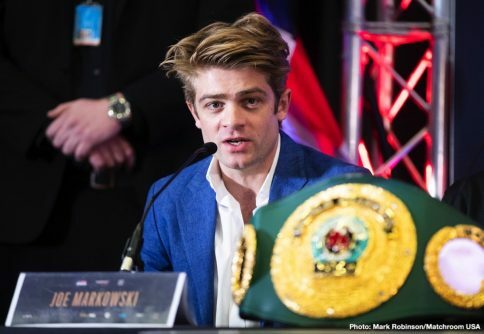 He’s not going to do it by beating Miller, who isn’t that well known either in the States, even though he’s from New York. 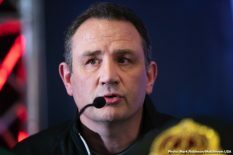 Miller hasn’t faced the type of opposition that he should have for him to build a large fan base in the U.S. 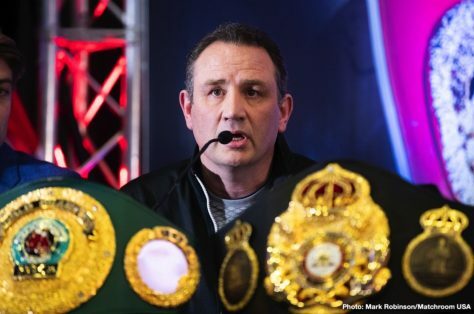 If Miller had beaten guys like Deontay Wilder, Tyson Fury, Luis Ortiz, Joseph Parker and Adam Kownacki, he’d be popular in America, but he hasn’t faced any of those guys. He probably lose to most if not all of them. 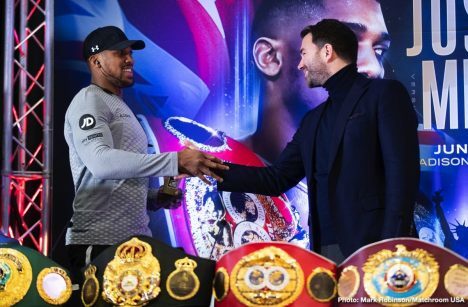 Joshua’s promoter Eddie Hearn has to be a little conflicted right now about this fight. 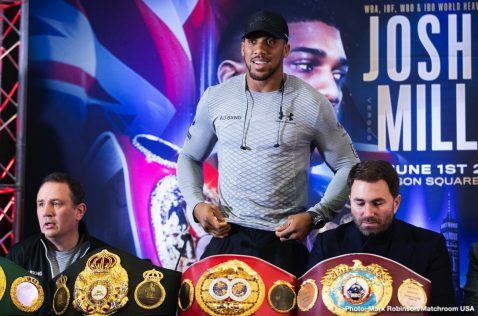 On the one hand, Hearn would obviously like to see Joshua score a knockout and look sensational in front of the boxing fans in his debut in the United States. 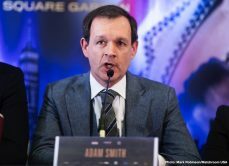 But on the other hand, Hearn co-promotes Miller, so it’s not good for him if he’s blown out by Joshua in this fight it’ll make Hearn’s job that much harder to try and bring Miller back from a knockout loss to Joshua.